It has been an honor for the team at A.Z. SHMINA, INC. to have been associated with Mike Mourer and John Franklin for the past 30 years. 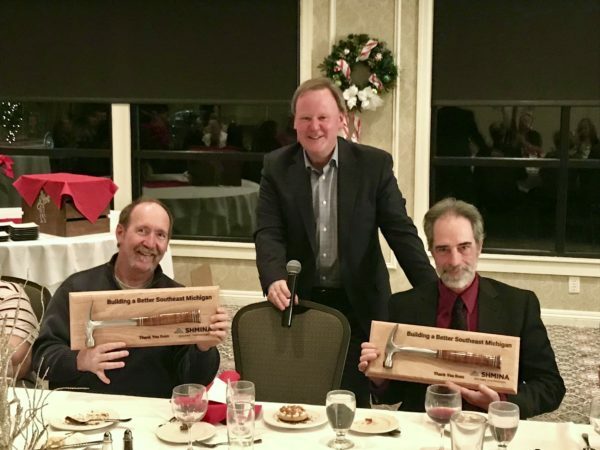 They are two of the best construction people in metro Detroit and have contributed greatly to our company with dedication, class and core values. We will miss them, but fortunately, they have been guiding others for years, imparting knowledge that is only gained by experience. In the picture, President/Owner Andrew Shmina provided a touching story at our Christmas Party honoring Mike and John, sharing stories about the jobs they worked on over the years, the challenges they overcame and the legacy they left for our team. Andy said, “Mike and John represented the A.Z. SHMINA brand faithfully for 30+ years, always stepping up to construction challenges on behalf of our customers and doing so with dignity, class and an incredible core set of values”. While we send off two great contributors, our team is revved up about the future. We have great people, training, process/technology and an impressive cadre of customers. All the best to Mike and John.